You'll love its matte fabric. You'll love its globetrotting inspiration. Yes to the safari jacket which multiplies stylish details Perfect with jeans for a chic and laid-back look. Zip fastening under a hidden button placket, visible press-stud at hem. 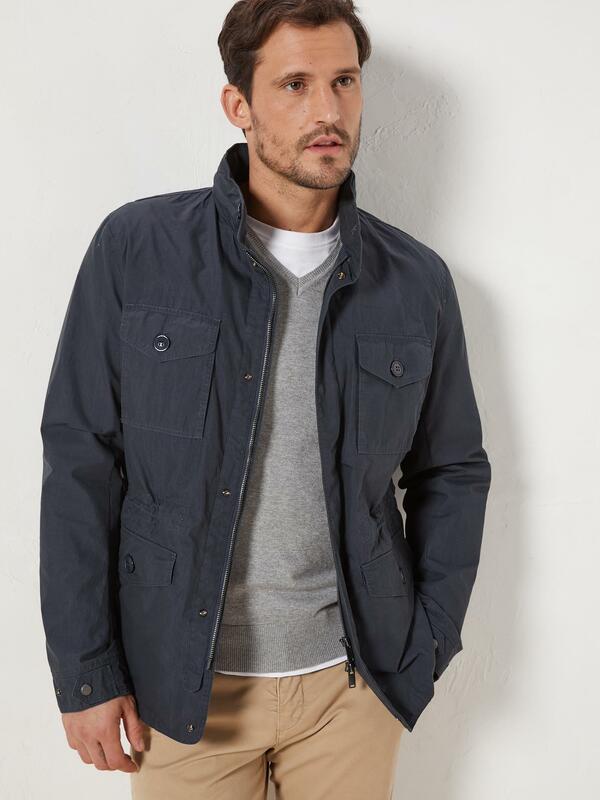 High button collar with incorporated hood (in zip pocket). 4 patch pockets with button flap at front. Adjustable waist with inside cased elastic tie with stoppers. Topstitched seams and 2 back press-stud slits. Press-stud cuffs with 2 adjustable positions. 1 inside zip pocket. Sleeve length 68cm, safari jacket length 71cm approx. 70% cotton, 30% polyamide, with water-repellent treatment. Defy the rain. The water-repellent treatment keeps the fabric dry without affecting its feel or natural breathability. With Cyrillus, men can choose the coat that will add the perfect finish to their outfit: a lightweight parka, an authentic trench coat, a leather jacket, a down jacket with or without sleeves, or a wool cloth pea coat. Choose at will.